What’s been the happiest moment of your life so far? What’s been the hardest moment of your life, and how did you get through it? If your great great grandchildren could listen to this years from now: is there any wisdom you’d want to pass on to them? What would you want them to know? If you could honor one person in your life — living or dead — by listening to their story, who would that be, what would you ask them and why? Need some inspiration first? 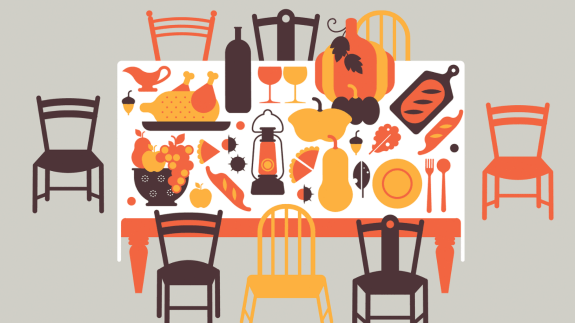 Below, check out 3 stories of gratitude and thanksgiving, chosen by Dave Isay. For more stories from the heart, listen to these 7 unforgettable StoryCorps tales and read Ties That Bind: Stories of Love and Gratitude from the First Ten Years of StoryCorps. “Scott Macaulay remembers how, 25 years ago, he started an annual holiday dinner for strangers who have nowhere else to go.” Listen to his story. “In 2013, Maurice Rowland was working as a cook at Valley Springs Manor, an assisted living home for elderly residents in California. He got his friend Miguel Alvarez a job there as a janitor last fall. But in October of that year the company that managed the home suddenly shut it down, leaving many of the elderly residents with nowhere to go. The staff stopped being paid so they all left, except for Maurice and Miguel. At StoryCorps they remembered caring for abandoned residents until the fire department and sheriff took over three days later.” Listen to their story. “Bryan Wilmoth and his seven younger siblings were raised in a strict, religious home. At StoryCorps, Bryan talks with his brother Mike about what it was like to reconnect years after their dad kicked Bryan out for being gay.” Watch the animated story.